This morning. 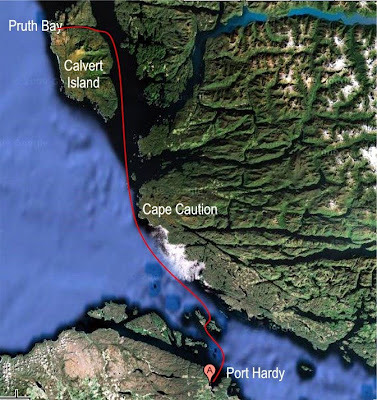 Monday, May 11, we leave for Pruth Bay, Calvert Island at 5AM. We are up early to get the 4AM weather report and check the wave heights at West Sea Otter Buoy in the Queen Charlotte Sound. Around 1-meter wave height and wind speed less than 20 knots is a GO!. Pruth Bay is the place Willie landed that big flattie (halibut) last year. We hope he is lucky again this year. If you are up early reading this post, you may be able to watch our progress as we round Cape Caution about 10AM. Look for Wild Blue at www.marinetraffic.com near northwest end of Vancouver Island. Just before we left, I checked MarineTraffic.com and couldn't see Wild Blue on the chart in Port Hardy. The AIS receiver for this area, or its uplink, must have not been functioning. Sorry if you got up early to watch and didn't see us (except fro John Pratt and Loren White who are up even earlier anyway). I found out the AIS receiver for the area is operated by the Head Lightkeeper, Ivan, who is based at the Scarlett Point Light Station, just outside Port Hardy. Anyway it's a courtesy service that's apparently not always operating. The West Sea Otter Buoy at 4AM had seas less than 1/2 meter, and winds less than 10 knots. Best I've heard of out of two previous crossings. 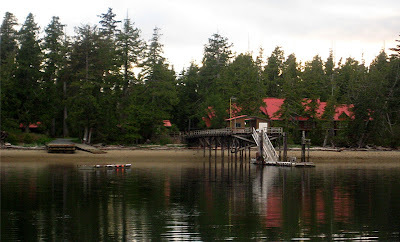 So it was a flat, easy crossing around Cape Caution and into Pruth Bay, on Calvert Island. We anchored and set prawn and crab traps. Of course we immediately dropped 3 lines and started fishing. Wild Blue Crew for the week: Joe, Willie and Mike. 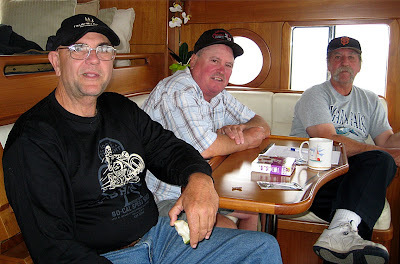 Our crew to Ketchikan is Alex's Cal Poly, San Luis Obispo, college roommates from 1966 through 1971. Pat has left the boat so the boys can relive their college experiences! Joe Cebe graduated with a degree in Poultry and now owns Cebe Farms out of Ramona, CA, a large, five ranch, chicken production operation. Willie Benedetti, a Poultry graduate and turkey farmer, operates WillieBird Farms of Sonoma, CA, which produces turkeys and turkey products, operates a turkey restaurant (recently featured on FOOD TV Guy Ferri's Diners, Drive-ins and Dives) and distributes gourmet turkeys through Williams-Sonoma. Mike Celentano received his degree in Business and operates a successful CPA practice out of Ukiah, CA. The guys met at Cal Poly and have kept in touch over the last 42 years. In college, we all wanted to be Willie's roommates because his family had a turkey ranch and we knew we would eat well. And we did, especially if you liked thanksgiving dinner every day! During Thanks giving and Christmas, we all would travel to Petaluma, CA and help Willie butcher fresh turkeys which folks would drive miles to buy. Recently Joe invited the boys to his daughters wedding as "a good luck charm". Since we also attended Joe and wife Becky's wedding in 1971, and they being together 37 years, he decided we would be good luck for his daughter's wedding! And so we organized our college reunion cruise while at the wedding. The fishing here in Pruth Bay was not so good, so maybe the water is too cold. We'll pull the crab and prawn traps in the morning before we move on to Shearwater-Bella Bella. Pruth Bay Fishing Lodge: 10 suites, 10 fisherman, 5 fishing guides, 1 great chef, open July and August only, awesome fishing, BIG bucks per week. We are heading north a few days behind you guys (hoping to make Blind Channel today and Port McNeil tomorrow). Dave McNary brought your blog to my attention. Sounds like you are having a decent ride so far... hope we get the same and that we can meet up in Alaska or Northern BC. Ken has raised the bar so you guys will need to add video clips..
Alex....where is your SPOT ? Dave emailed me and I saw your fine blog. We are now at Shearwater and it seems pretty quiet up here compared to last year. Lots of room at the dock. The weather has been fine for cruising but not as nice as Ken on SS had last week. We'll stop at Bottleneck Cove today then try to do a long day to Prince Rupert tomorrow. We'll look for Serendipity up here soon.